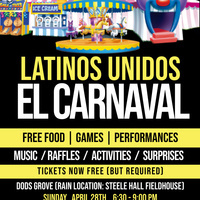 Latinos Unidos will be holding their annual El Carnaval once again! This huge outdoor event will be fun-filled with rides, food, activities, games and performances from some of your favorite student groups on campus. Tickets are free but required from the Ticket Office.